While anti-Semitism rages all over the world, we may be blind to the fact that it’s also growing right here in our own backyard. We thought America was PC—that anti-Semitism wasn’t cool anymore—and that this would protect us from it. Unfortunately, that was only a fad, and anti-Semitism is back. And it’s pretty ugly. Anti-Semitism is on the rise in the United States. In 2006, the U.S. Commission on Civil Rights said that anti-Semitism had become a “serious problem” on many campuses across the country. (JTA, Kenneth L. Marcus, Dec 8, 2010). But here’s what’s new this time around. Often, the anti-Semitism is cloaked in anti-Israel political sentiment. And somehow that makes it okay. 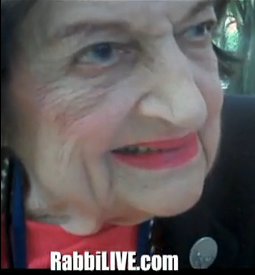 In the first Helen Thomas incident (an interview with RabbiLive.com), she felt perfectly comfortable saying that that the Jews should “get the hell out of Palestine” and “go home.” (May 27, 2010) Watch the Video. One could have argued that she was simply stating a political opinion. However, her second comments (above) show her real beliefs. You can’t mistake her “Zionists” comments as anything but anti-Semitism. Thomas is of Lebanese descent. Again, the lines are blurring, and apparently, at least to some people, anti-Semitism is now something to be proud of. Israel has close ties of friendship with the United States. But that doesn’t mean that people in America can’t protest against Israel. Legally, they can. The problem is that it insults our sensibilities as Jews. We are so identified with Israel that insulting Israel is a direct insult to us. Whether justified or not, we do often think of this last group of incidents as anti-Semitic. And these kinds of incidents are on the rise as well. I don’t think previous administrations would have stood for any of this nonsense one bit. However, President Obama’s own left-liberal stance has allowed this sentiment to flourish in America. They use words like “human rights,” “religious freedom” and all kinds of butchered American values to justify their arguments. And unfortunately, many otherwise good people, including many liberal Jews, fall into their trap. The irony is that if these people only put things in perspective, they would see how life-affirming, growth-oriented, and progressive Israel and the Jews actually are. They would see how life-loving and generous we are as a people, and how much we further world peace, religious freedom and human rights for all. There’s something very ugly about this new anti-Semitism. Things are being said that would never have been said just a few years ago. Helen Thomas waited until she was 90 years old to show her true anti-Semitic colors. Which public figure will be next? On the international scene, this new kind of anti-Semitism comes from high-profile sources, and goes hand-in-hand with anti-Israel political sentiment. Physical attacks against Jews are also on the rise in Europe. Jews in Holland, Hungary, Austria, France, and even England are questioning the future safety of their communities. Sadly, nobody can guarantee Jews a truly safe place to live. Terrorism, Anti-Israel sentiment and anti-Semitism are taking hold around the world—and yup—in our own backyard, the US of A. What do you think about anti-Semitism taking on this new form and increasing around the world?